Visually impaired artist Jeff Hanson is attending the Rolex 24 at Daytona this weekend. His art is being featured on the Porsche 911 GT America, the No. 73 racecar, as part of a fundraising and awareness campaign for neurofibromatosis called Racing4Research. Jeff Hanson lost most of his vision as a child, due to an optic nerve tumor related to neurofibromatosis, but it didn’t stop him from pursuing his passion for painting. Hanson’s art will soon be featured on the Porsche 911 GT America, the No. 73 racecar, at the Rolex 24 race in Daytona this weekend. The project benefits Racing4Research, a fundraising and awareness campaign for neurofibromatosis. In an interview with Hanson, MABVI learned about his inspirations and his creative process. MABVI: How did you discover your passion for painting? 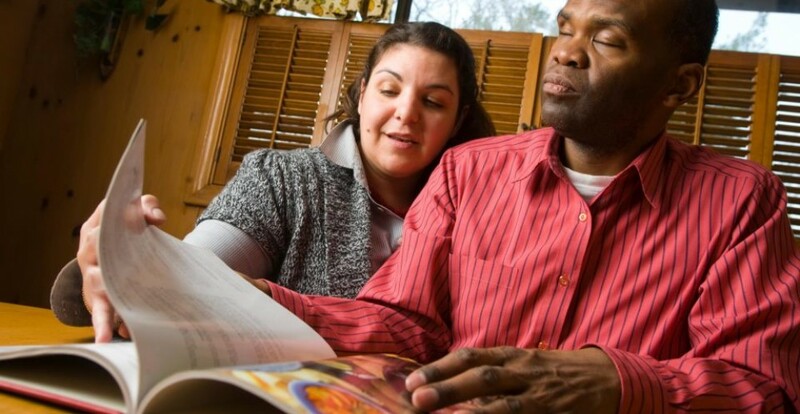 Was it before or after your vision loss, and how did it develop afterward? JEFF HANSON: At age 12, I started painting watercolor note cards during chemotherapy to my optic nerve tumor, which I nicknamed CLOD. Painting was a joyful activity during this frightening time in my life. I assumed I would go [completely] blind. I very slowly lost vision from ages 6 through 12. Finally my vision got so poor that my medical team recommended chemotherapy and radiation in hopes of preserving the remaining vision. Miraculously, my vision improved after radiation. I always had a unique sense of color, but now that my vision is better I can paint colorful abstract landscapes better than ever. MABVI: What do you enjoy most about painting right now, and what do you like about the textures of painting? 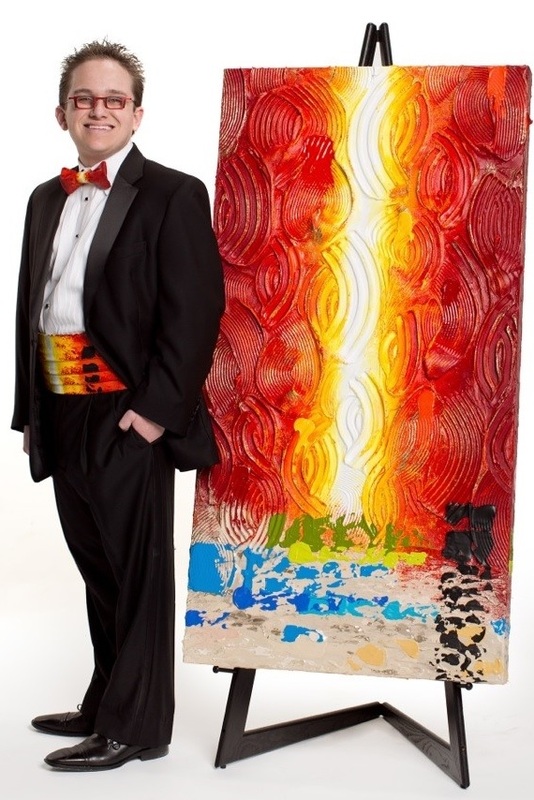 JEFF HANSON: I love applying heavy texture to the canvas. My eyes do not work perfectly, but my sense of touch works great. Thus, heavily textured canvases are my favorite. My paintings are travel inspired. I love traveling the world and coming home to my studio and painting my interpretation of what I have seen, such as a field of blooming poppies in Tuscany. MABVI: Are there any artsy gadgets or tools you would recommend? JEFF HANSON: Most of my painting tools come from Home Depot, not an art store. Putty knives, scrapers, tiles, trowels, rollers, Q-tips, spatulas and occasionally paint brushes are used. Anything that creates more texture is a bonus. I paint with the canvas sitting on the floor. No easel. My acrylic paint is applied so heavily that it would ooze to the floor if the canvas stood vertically. MABVI: Can you tell us about how you have managed to live with “CLOD” without letting it define you, and how your positive attitude has influenced your work and lifestyle? JEFF HANSON: American author Maya Angelou put it this way: “You may not control all the events that happen to you, but you can decide not to be reduced by them.” Don’t let CLOD define you! It is important to focus on what you can do, not what you can’t do. Buck up and find your niche, find activities or careers that interest you. 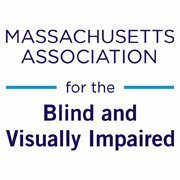 MABVI: What are some of the biggest misconceptions people have about vision impairment and the arts? JEFF HANSON: Unfortunately, the majority of the public does not know about the abilities of persons who are blind or visually impaired. People who are blind or visually impaired are working in nearly every career field, almost anything not involving driving. I am an accidental artist and a visually impaired one at that! Want to find out more about Jeff Hanson? Visit his website at www.JeffreyOwenHanson.com. 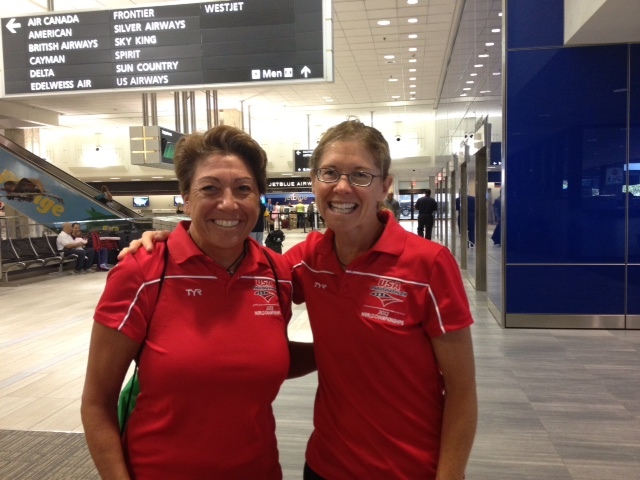 Diane Berberian (left) competes in the ITU World Championship with her guide, Dina (right). Diane faced sensory overload when she traveled to London for the championship, but she learned to adjust to the new environment and work with Dina to gear up for the race. Every time that I stepped outside of my comfort zone over the past two years has provided me with the best lessons. What I am about to share is what I learned from my travel to London to participate in the International Triathlon Union (ITU) World Championship. WRONG! I have never traveled outside the United States, nor had I participated in an ITU race with its multiple-loop bike course. London would provide me with little to NO color contrast due to grey skies and rain (my vision is better when I have color). I was dependent on my cane and my guide, Dina, to increase my safety. The streets and sidewalks were crowded, and for some reason my people wore black clothing. I thought, so now I have too much motion in my line of vision and dark colors? Not good! The sounds of the city were “foreign” to me. Cars approaching from another side of the road? Even the birds were sounding different to me. I was not afraid, but I would learn on my second day that I was experiencing some sensory overload and that I use my hearing more than I realize to help me see. I have some usable peripheral vision, but never did I realize that I am assisted a lot from my hearing. Dina and I took the tandem into Hyde Park. There were cars, other athletes riding, people on foot and bicycle commuting, race staff setting up the course, animals, traffic sounds and Dina trying to communicate with me about the bike course. I could pay attention to her commands as I was also trying to hear all the other unfamiliar sounds. I was a mess. I felt nervous and agitated; my body was stiff and awkward. I had never felt this before, and I did not want to pedal one more stroke. I had to get off the bike now. Dina tried to get me to continue but I could not. I needed to figure this out; this was not me. Dina took the tandem and went to check out more of the bike course while I sat on a curb and cried. Once I quieted my mind, I realized that I was overloaded with too much information. Dina returned to a calm Diane as I realized that I was using my mind and ears to see. I knew what I needed to do now to be successful on race day. I needed to stop trying to see. After all, this is why my guide is with me! My coach Jeff suggested that we go on the course on foot with Dina describing what she is seeing with my eyes closed. I learned to accept those other sounds but use Dina’s voice as the important information. On race day, I was fine. Yes, I heard many sounds but priority one would be Dina. On the tandem, I did not pick my head up and had to ignore anything that my vision would pick up in my peripheral vision. I feel very fortunate to continue to travel outside my comfort zone so I can continue to grow and become confident in my skills. I wonder where I will be for the next lesson. Diane Berberian is a visually impaired Ironman triathlete and the self-described “Iron Maven.” Follow her blog. New Year’s Resolution to Volunteer? Volunteers often form long-lasting friendships with the individuals they work with. “It has given me and my wife an opportunity to form a very good family relation with the person I work with as a volunteer. I have also benefitted by being exposed to an individual with a superior mind,” says volunteer Stan. For more information on how you can become a volunteer, visit our website.